Whether you’re into lists, maps, or just thinking about how much fun you had on your last vacation, it’s fun to create an easy way to recall all the cool places you’ve been to. If you’ve ever taken a road trip along an interstate highway, you’ve probably passed RVs adorned with colorful maps showing the states and provinces they’ve visited. (We’ve even seen RVs sporting maps of European countries!) Now you can create your own –free!– map without covering your car doors with those pesky stickers. Several websites generate virtual sticker maps for Canadian provinces as well as US and Mexican states. 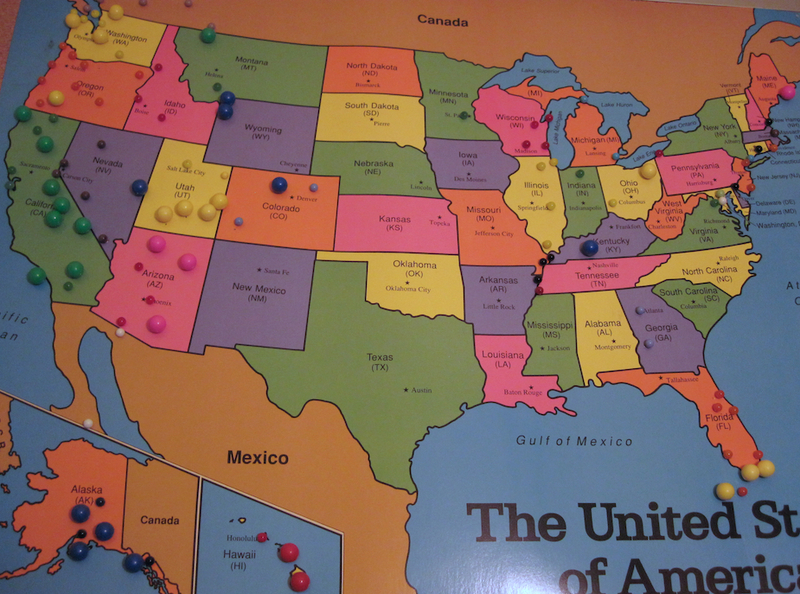 For years, we’ve tracked the national parks, cities, and states we’ve visited using colored push pins on a US map tacked to an old dorm-sized bulletin board. Low tech, sure, but simple. It’s always fun to put a new pin on the map after we travel to a new location. 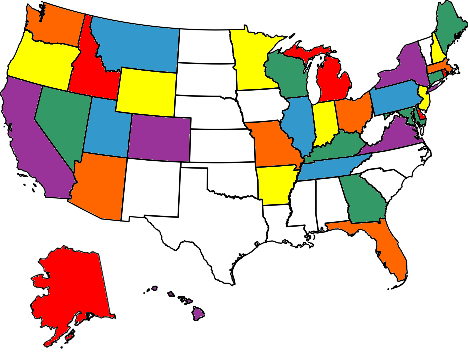 If your travels are usually closer to home, a regional or state map might do the trick. If you’re an international traveler, try a world map. Have kids? Let them do the pushpin honors after every trip! Old school trip tracking – no electricity required! We recently stumbled across ZeeMaps.com. With a motto of “We Map Your Lists” and the ability to link photos, text, and websites to each of your map markers, it’s a creative, multimedia way to track your travels on one map or on a series of maps. Check out our ZeeMap to see how we’re doing in our quest to visit all 58 US National Parks. The parks we’ve visited have color NPS logos, parks on our “to see” list have black & white logos. Keep checking back, as we’ll add more links to photos and travel tips about those parks as well as other destinations we’ve visited for a week or a weekend! Have you been to any of the parks left on our list? Leave us a comment – we’d love to hear your travel tips, too! Oh, the pins are really just about my AR husband….Colors match the state where possible, but apparently Colorado got short shrift b/c we had no orange pins. You are right, the big pins are NPs. Smart girl, you are. The smaller ones are non-park places we’ve visited. Thanks for the comment!! There must be an AR gene, So sorry, Erin!